It’s the Monday before Thanksgiving and anticipation for the approaching holiday is running high. I went and read to my 1st grade class last Friday and they couldn’t wait to eat turkey, chicken, corn, and mashed potatoes. Thanksgiving is a favorite of my wife and children as well, and we as a family are looking forward to the time together. One thing I am thankful for is the fantastic teaching at Tusculum ES where my kids attend. As you all know, Tusculum is a high needs school. It’s the kind of school that parents often fret about sending their children and school critics try to paint as a failing school. In truth, there is no need to fret, and the school is anything but failing. I’m often critical of MAP testing and continue to believe that as a district we are using it wrong. However, when used as intended – to reflect growth and guide instruction – it is a very useful tool. Over the last couple of weeks, MNPS students have been taking the MAP tests. I like the way Tusculum does it – no fanfare, no hoopla, just, “Let’s see what you know.” I’m blessed to have two high achieving children, and they score well on the MAP test. Which obviously makes me proud. What makes me even prouder is that they continue to show growth. As a parent, I’m no different from any other parent. We are all victims of the hype and fear mongering. I can’t tell you the number of times that I’ve been told, “Don’t sacrifice your children at the altar of your ideology.” As a result, we often question whether we are making the right decisions for our children and if we are putting them in position to succeed. Looking at my children’s MAP scores for the last 2 years reaffirms my decision. They are growing academically and culturally, and as a parent I couldn’t want for more. So this Thanksgiving season, let me take another moment to thank everybody at Tusculum ES, from the leadership team to the ladies who run the office and everyone in between, including the crossing guards. Every day I put my children in your hands and every day you reaffirm why that was a good decision. You are living proof that schools are more than just test scores and that parents from all demographics can feel good about putting their children in their local school. Thank you again. Over the course of the year, there has been an intensive conversation about the suspension, expulsion, and arrest rates for children ages K-4. 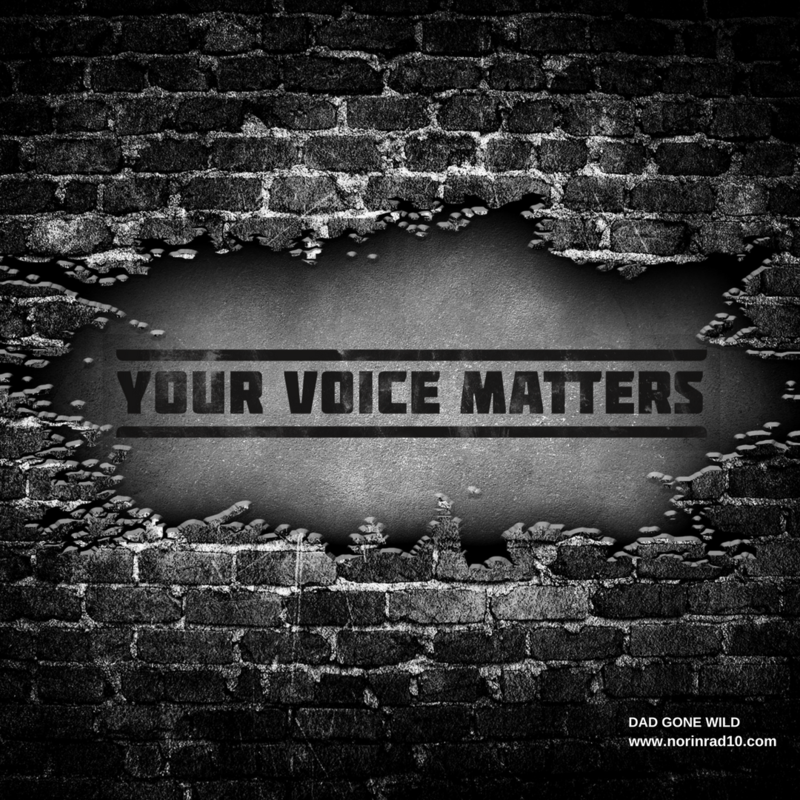 NOAH has led the conversation and believes that it is necessary for the district to create a policy prohibiting the suspension, expulsion, or arrest of any child in K-4 except for 500 level offenses. Today, principals should expect to receive notification of a policy change that reflects that belief. A policy change that I disagree with. Before we get too deep in the weeds, let’s be clear that I do not support the suspension, expulsion, or arrest of children in K-4 either. But I don’t believe that you take tools out of the hands of principals without putting other tools in their hand and concrete instructions on how to apply those tools. I also believe the conversation takes the focus off of 95% of the students and places the focus on 5%. The reality is the vast majority of kids go to school, follow the rules, and stay out of trouble. There is a reason that the kids who run afoul of the rules do so. Some of it stems from implied bias and racism, and as such, needs to be addressed. The majority of it comes from the severe level of trauma that many of our students face in their daily lives. As a result, they need very specific services in order for trained professionals to help them address that trauma. The key words in that sentence being trained professionals. That’s where I take an exception to the new policy. It puts the horse in front of the proverbial cart. The problem being solved shouldn’t be whether a child remains in school or not, but rather, “How do we get the child the services that they require?” This new policy outlines none of that. There is an assumption made that if students remain in school, those services will miraculously be made available. While we recognize that there are areas that need shoring up, we assume that eventually funding for those additional services will be secured. Little detail is given as to how those needs should be addressed until “eventually” arrives. Unfortunately, “eventually” never seems to arrive, and teachers, with minimal training, are left to try to provide those high level required services. We scoff at the idea of TFA candidates being qualified to be classroom teachers after 6 weeks of training, but we readily accept the notion that with some PD days, a restorative circle, and some empathy, classroom teachers are equipped to meet the needs of students suffering from intense trauma. We also talk about the urgency of a student’s education, yet we ask those children who follow the rules and try to learn as much as possible to sacrifice weeks of instruction while a teacher provides services for a troubled student due to a policy that limits options. Where is the equity in that? We also choose to ignore the fact that our schools are understaffed with teachers already. Attend any PTA meeting across the district and you’ll hear parents talk about the lack of math teachers or the use of long-term subs to fill vacancies. How is a child who has very real needs better served sitting in front of a long-term sub versus sitting at home? I don’t have an answer to that question, but I can tell you how adults benefit from the policy. An administrator gets to mark that student present and the district’s rate of chronic absenteeism drops. Under the new ESSA act, that chronic absenteeism number carries a lot of weight. Chronic absences are not factors into funding and the distribution of other resources. Talk to principals and teachers, and few of them support this policy. They certainly believe in the idea behind it, but they don’t believe this policy matches up with the ideal. Dive into the reasons why we are experiencing a nationwide teacher shortage and the subject of discipline rises to the top. Teachers don’t feel like they have any control and as a result, many don’t feel safe. I know when we talk elementary kids, we picture cute little kids capable of little damage. As a parent of a third grader and a fourth grader, I can attest that is not the end of the story. It is not uncommon to find a 100-pound fourth grader or even one like my son who weighs 60 pounds and is wicked strong. The point is, teacher fears are not unfounded. In this proposed policy change, bullet point 3 says that “Law enforcement will not be called to arrest students in grade PreK through 4 (except for 500-level offenses). Administrative staff will call the Community Superintendent rather than the police.” Take a look at the student handbook (Starting on page 40) and you’ll see that assaulting a teacher is a 400-level offense. As is sexual assault and gang intimidation. In fact, the only 500-level offenses are attempted homicide, homicide, possession of explosives or a firearm, and dealing drugs – which I would argue should be a 400. Aggravated assault of a teacher is a 500-level offense, but what defines aggravated? According to the handbook, “aggravated” is anything that causes more than “basic first aid.” And who makes that determination? I can think of at least one administrator this past year that suffered the consequences of a concussion as a result of a student action. Did that initially require more than “basic first aid”? I just don’t know how you can tell a victim of assault they don’t have the right to call the police unless they run it by their boss. My fear is that in implementing this policy, we will negatively impact another area of need. If teachers do not feel safe in the classroom, they will ply their trade elsewhere. There is nothing, in my eyes, in this policy that takes into account teacher safety and the safety of fellow students. That should be problematic to everyone. Equity means everybody, not just selected sub-groups. Another concern of mine is that once again we are implementing policy without the supporting work. Where is the timeline? Where is the training? Where is the communication plan? It is this complete lack of supporting implementation that always makes me suspect about whose needs we are actually serving. Are we truly serving kids if we implement the change with no meaningful training? How effective can the policy be if we implement it but have only communicated the “what” and not the “why, how, or when”? What about the implementation before fully informing parents? Do they even understand the changes or the need? Should they not be fully versed on a policy with potentially adverse effects on their kids? Education should be about getting it right, not getting it fast. Is there a parent out there who thinks, “I like my school but we’re just not improving as fast as the kids in Houston’? Or conversely, “I don’t like my kid’s school but at least they are improving faster than schools in Las Vegas.” Quality needs to always trump speed. I’ve got to ask where the sense of urgency comes from. A glance at the data supplied by NOAH shows that the district is trending in a positive direction. Suspensions and expulsions are declining, though racial disparities still exist and are maintaining their levels. That being the case, why the rush to write policy? What’s the actual problem that is being addressed here? Yes, work needs to be done, especially on racial disparities, but it should be deliberate, well thought out, and effective work. Work that also puts an equal burden on city and state leadership in addressing. 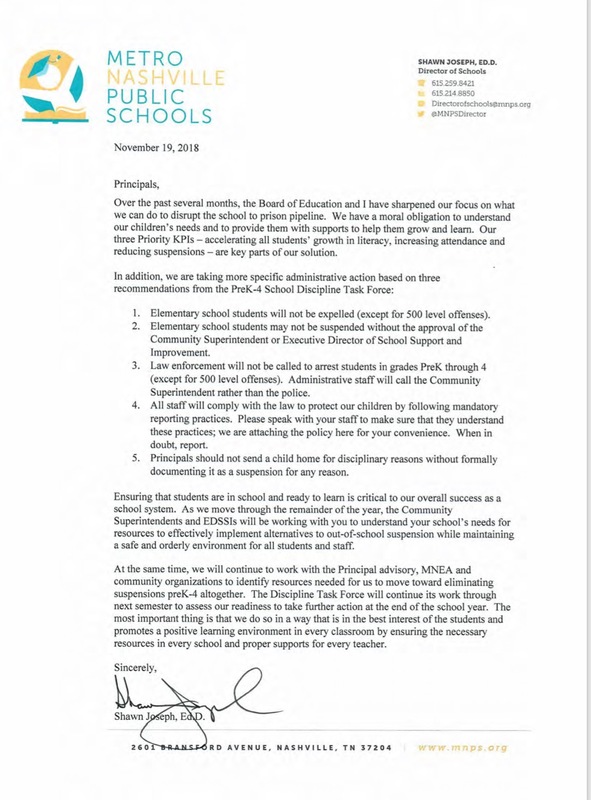 As for today’s announcement, being as it is the Monday before Thanksgiving, let’s see how many principals actually read the edict, let alone communicate it to staff. Of course, the weeks between Thanksgiving and Christmas are always a prime time to address policy changes. That was sarcasm. One thing this letter does do is allow Dr. Joseph to check a box when he makes a case for a contract extension. But how is that really putting kids at the forefront? School board member Amy Frogge continues to fight for teachers and students with her latest Facebook post. Many wish she would quit bringing these very real issues to light as if they would cease to exist if nobody acknowledged them. Critics of Frogge make the argument that her calling attention to the issues hurts funding. I argue that it’s the issues that hurt funding. Just like arguing in front of the kids doesn’t wreck a marriage. Not addressing the issues wrecks a marriage. The poll response was a little light this week, but still some worthwhile answers. Let’s review. Question 2 asked for your opinion on the prospect of hiring 2 individuals in Metro’s audit department to oversee MNPS spending. 27% of you classified the move as “more political posturing” with the number two answer being, “Maybe if he’d just go to meetings this would already be in place.” Only 2 of you felt this was the kind of stuff Pinkston was elected for. So nice of him to show up for work. Ridiculous waste of money. School board should just do it’s damn job! The last question asked who you thought should be the next State Superintendent of Education. I love that Hillsboro HS Principal Shuler Pelham garnered the most votes. The state could certainly do a whole worse than elevating this respected educator. Some of the write-ins made me laugh aloud. Dr. Joseph. We’d be happy to share him with the whole state. A real, truces and true educator who is empathic and savvy. Shawn Joseph. He’d screw us less than he is now. Finally had a look at the 19-20 calendar and pissed as hell. How do I get on this committee??? We start JULY 30. Then we have a PD heading into Labor Day weekend. Kids get 4 days and we can’t get away early. Kids get 4 days again at Vets day. Why in the heck didn’t they combine Vets day and conf day??!! Parents have off largely! Now Nov instruction is a holey mess again and we could have saved a day in July. Then again in Dec we finish on Thursday and why not Fri? Christmas isn’t even until the Wed of the next week – plenty of time to get to destinations and could have saved ya the other day in July. Then Ts are expected in March when letting out on a half day to do PD the other half. Why??? I’m sure that will be high quality time. Could the committee have consulted families? Teachers with families? It really seems so fixable. C’mon. And that’s **without** me even touching anything related to fall break being disconnected to the PD day later the same week we get back. Or the fact that for a few years we’ve been expected to give up family time at Presidents Day which is right in the year when you are the most tired and need some family time with your kids who are….. you guessed it…… out of school that day. Stop giving the students three fall breaks that slow their academic momentum and give us a whole week off at Thanksgiving. And stop eating into my July. Hey if Dorsey Hobson is getting out of the game to go make $$ you can bet the next ed chief will be no picnic. He did a good job in a tough spot and will be missed. Maybe Shawn Joseph will try to make the lateral move to larger SCS? Only that would involve a pay cut……..